LinkedIn is previewing a redesign of the pages that it lets companies set up on its professional networking site. The revamping seeks to make these pages more effective for the companies and easier to use for visitors, LinkedIn said on Thursday. A few companies including Philips, Citigroup, Hewlett-Packard and Dell are getting access to the new pages this week. 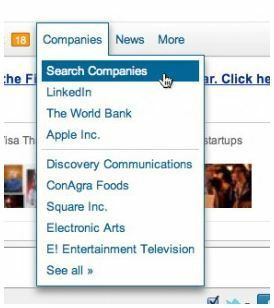 LinkedIn Company Pages, which are free to set up, let businesses interact with site members and offer them a variety of information about their products, job openings and business opportunities. Companies will get new LinkedIn pages later this year. In the redesign, company news and updates take a more prominent placement, and the layout has been changed to make navigation simpler and more intuitive, according to the company. LinkedIn will also now allow companies to display a large photograph at the top of their pages to complement their logo, and tweaked the activity stream feature to make it more effective, the company said. The new Company Pages template and features will be available to all companies "later this year," according to LinkedIn. Another improvement for Company Pages is that they can now be accessed from LinkedIn's iPad, iPhone and Android applications. LinkedIn also announced other enhancements to these mobile applications, including real-time notifications of actions taken by contacts. LinkedIn also added six language interfaces to the iPad application: French, German, Italian, Spanish, Brazilian Portuguese and Korean. Coming soon to these mobile applications is the ability for members to edit their profiles. LinkedIn has more than 175 million members worldwide who use the site for professional networking, job seeking and other work-related activities. With a free, basic account people can set up a profile, establish contacts, post comments and links, join groups and peruse news they find relevant. LinkedIn also offers paid accounts that give members more features and capabilities, primarily in the area of job hunting. Professional recruiters and sales executives can also purchase accounts tailored to their needs.